Nowadays, brakes that are used on different types of hauling trailers come in a variety of options. If you are a professional haulier and wish to maneuver your towing equipment on the road properly, you must purchase the appropriate one according to the regulatory state laws. Some states in the USA require the trailers within their boundary to be compulsorily equipped with brakes. But there are also states that prescribe various guidelines; regarding the quantity of axles which should be used and so on. Trailering and towing experts usually recommend single and multi-axle trailer owners to install brakes on their equipment, even though tow vehicle manufacturers provide their own specific criterion. Therefore, commercial vehicles normally utilize air and hydraulic brake mechanisms which consist of one circuit that must be used by both the tow vehicle and trailer. Towing equipment meant to be used for recreational purposes, on the other hand, have hydraulic or electric surge systems. Such mechanisms usually consist of a breakaway chain device that can help to stop the trailer by force if the hitch fails. However, irrespective of whichever brake system is used, it works in a specific way - through forced application of pad or shoes on a drum or disc for transforming mechanical energy into heat energy. Ultimately, the resulting heat energy dissipates if wheels or fenders are absent. Alternatively, the heat passes on to the wheel bearings, seals and fluids if there is overheating. 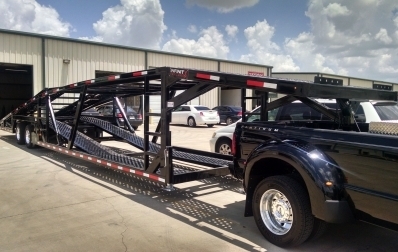 In the recent times, most modern car hauling trailers are designed to have hydraulic self-contained brakes because they far more efficient than the electric surge ones when it comes to handling immersion. They contain wheel units along with a master cylinder on coupler. When a tow equipment is coming to a halt, the cylinder receives a force from the lever that causes the fluids to move through lines and ultimately, push the calipers or shoes against the disc or drum. Earlier, most hydraulic surge brakes had drums, but modern designs are incorporating discs rather than drums. Discs offer a wide range of benefits - they do not require pre-adjustments for wear & tear and also have highly effective heat & water-shedding abilities. Nevertheless, a small amount of adjustment might be required for the shoes to reduce wear. The coupler may also necessitate lubrication from time to time so that it easily slides under the load. Liked this post? Don’t forget to share it. If you want to see more posts like this, stay connected to our blog space.